Bled is a town in Slovenia, on the east side of Lake Bled. Bled is a popular destination in Slovenia due to its romantic scenery and access point for Triglav National Park, which offers numerous outdoor adventure opportunities. The town features a little white church on an island in the center of an emerald green mountain lake, with Bled Castle perched high above, amidst the Julian Alps. The closest airport is Jože Pučnik Airport (LJU IATA), which is easily accessed by bus for €7 or by taxi for €40 and up to €55; see the link for details. Near Lake Bled is a small civil airport Lesce-Bled for fun and sports fliers. The bus station in Bled is centrally located northeast of the lake at the intersection of Cesta Svobode and Grajska Cesta. Buses leave from Ljubljana to Bled hourly on the hour and return from Bled to Ljubljana hourly on the half-hour. The journey takes 75 minutes and costs €7. Schedules are available online. Trains from Ljubljana drop passengers off at Lesce-Bled station, 4 km southeast of Bled. The journey takes slightly under an hour by regional train. These run irregularly, but more or less once every hour. In addition, there are a few IC services a day, which are slightly faster. Buses connect the station with Bled at least every 30 minutes for €1.30. A taxi to/from the station costs €10. Bled Jezero Station is on the other side of the lake, opposite the town, 1.5 km away. From here, trains leave to/from Jesenice and Nova Gorica every two hours or so. Train schedules are also available online. Bled is small enough to cover on foot. A walk around the lake will take just over an hour. A popular method of travel to the island church is by renting a rowboat. Bled and the vicinity are great for riding bicycles, which can be rented at many outdoor agencies. There are no designated bike lanes in Bled. Cycling off-road or off-track is not allowed in Slovenia. A list of suggested bike routes is available here. Horses are available for rent, with or without guides/instructors, at most outdoor agencies. In addition, horse-drawn carriages are available for rides around the lake, to the castle, and further afield. View of Bled Island in autumn with snow covered alpine peaks. 46.3679314.1053111 Lake Bled. Formed after the recession of the Bohinj glacier at the end of the Ice Age. As much as 2120 m long and 1380 m wide. Maximum depth is 30.6 m. With no natural tributaries, it is fed by a few springs. 46.36972214.1005562 Bled Castle (follow the paths marked Grad for a 15 minute steep climb). 8AM-7PM, until 5PM in winter. A picturesque white and red castle enclosed by a Romanesque wall with parapets, ramparts, and towers. The current incarnation of the castle dates from the 17th century and was restored in the 1950s. The upper courtyard includes a 16th-century chapel decorated with frescoes from 1700 and includes a painting of Henry II conferring Bled to Bishop Albuin. There is a small museum with an exhibition on the castle's history and the usual array of medieval pomp, pageantry and weaponry. However, the items do not include descriptions in any language. The castle terrace offers great views of the lake and island below. There is also a small wine center run by Andre, the monk. There, for the price of a champagne bottle (€15) Andre will teach you how to perform Sabrage, or Sabree, the art of cutting the top of the bottle off with a blade. You can also bottle, label, and wax stamp your own wine right in the cellar with Andre. The wooden steps near the wine cellar lead to small shop that sells various herbs and oils. Go in here for the smell. Adults €10, students €7, children 5€. 46.362117314.09063523 Bled Island (By rowboat or pletna - see above). Excavations on the island have revealed the remains of a pre-Romanesque Chapel and a large Slavic cemetery dating to 9 AD. 46.362117314.09063524 Church of the Assumption (Cerkev Marijinega Vnebovzetja). 8AM-dusk. The present baroque church dates from 1698. Well preserved frescoes depict scenes from the life of Virgin Mary. Ring the wishing bell, which was installed in the original Gothic church in 1534. The Provost's house and the smaller building behind the church were used as guesthouses. According to local tradition, a husband who can carry his newly married bride the 99 steps up from the dock into the church will be ensured a happy marriage, and ringing the bell in the church will fulfill one of your wishes. €3. 46.34809414.0596615 Iglica Waterfall (4km southwest of Bled, in the caves of Iglica, near the village of Bohinjska Bela). 18m high, but very narrow waterfall over a vertical wall of Permian limestone. Popular for rock climbing. If you go up the stairs you have a beautiful view over the whole area. Babji Zob (Hag's Tooth) Caves (4 km southwest of Bled, near the village of Bohinjska Bela). 300m cave system includes rare helictites (calcium deposits) and a tooth-shaped pillar atop a 1128m peak. Very different than other caves in Slovenia. Three-hour tours take place Wednesdays, Saturdays, and Sundays in the summer. Meet at Bohinjska Bela 34. Most of the outdoor adventure activities, as well as the must-see Vintgar Gorge, are in nearby Triglav National Park. However, Bled also offers numerous activities. Hiking. Bled offers several easy to moderate hikes, many of which offer amazing picturesque views of the island. Velika Osojnica, a 756m high peak at the southwestern corner of the lake offers the best and most famous views of Bled, and is popular among photographers. An easier, but less spectacular option is to hike up 638m Straza, covered with linden oak and spruce trees, southwest of the Grand Hotel Toplice. Swimming at Grajsko kopališče (Castle Bathing Area) (on the north shore underneath the castle). Mid Jun-Sep 8AM-7PM. 6,000 m2 area, a great place to swim, also has two waterslides, a trampoline, a climbing wall, four outdoor swimming pools, a jump board as well as climbers, swings and a sandbox for children, table tennis, chess, 1,000 changing rooms, 107 lockers, boat rental, snack shop, and a grassy beach. €6 for a daily ticket, €3 after noon. Strel Swimming Adventures. Swim across Lake Bled and around the Island with well known operator for Slovenian swimming adventure holidays. Indoor Ice Skating at Sportna Dvorana (just east of the Park Hotel), ☎ +386 4 578 0534. Fee: €4.50; Skate Rental: €4. Bled Golf & Country Club, Kidriceva 10c (2km east of town on the Bled-Lesce Road), ☎ +386 4 537 77 00. Slovenia's premier golf course. 9 holes €30, 18 holes €60. Mini Golf, Ljubljanska cesta (Behind Hotel Park), ☎ +386 41 840 079. 9:30AM-11PM. 18 holes. Hosts a variety of classic mini golf competitions, including the National Championship. 3Glav Adventures. Reputable outdoor adventure company with the best rates for skydiving and paragliding. Alpine Flying Centre. Panorama flights, glider rental, and tandem para-jumps. There is also a good restaurant. Spas & Wellness Centers. Unwind in thermal pools, whirlpools and saunas, or alternatively let yourself be pampered with a soothing massage, a calming bath or a rejuvenating beauty treatment. Ziva Wellness Centre, Cankarjeva cesta 4 (at the Golf Hotel). Summer tobogganing, ☎ +386 4 578 05 34. Open only during the summer. Ride down a 520m track on a 131m hill in a small cart. Speeds top out at 40kph. Fishing. Fishing for catfish, pike, carp and lake trout is permitted on Lake Bled with the purchase of a permit from the tourist office for €20 per day. Bled Days. On the 4th weekend of July. Three days of fairs and concerts. The event culminates in fireworks and the lighting of thousands of candles on the lake. Okarina Etno Festival. 1st weekend in August. Ethnic festival featuring folk music performances. International Music Festival Bled. Early July. Classical music festival. Most of the hotels have restaurants and bars. In addition, the following are stand-alone restaurants worth a visit. Prices in Bled tend to be inflated due to the tourist nature of the town. 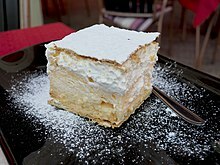 Try the local speciality kremna rezina also called kremšnita (Cremeschnitte), a cake of vanilla custard and cream. Castle Restaurant (At Bled Castle), ☎ +386 4 5794 424. Good for special occasions, but not as expensive as you might think. Booking advised, especially for outside tables by the wall. 46.371103114.10480821 Gostilna Pri Planincu, Grajska cesta 8, ☎ +386 4 574 16 13, e-mail: pri.planincu@siol.net. Over 100 years old. Still retains original ambience. Labod, Cesta svobode 8a, ☎ +386 4 5798 453, e-mail: info@restavracijalabod.si. 12PM-11PM, closed Sundays. Nice view. 46.366657714.10976542 Okarina, Ljubljanska cesta 8, ☎ +386 4 574 14 58, e-mail: leo@okarina.com. Amazing quality, large menu blending Indian and Slovene dishes including a substantial vegetarian selection. Not the cheapest, but high quality and extremely friendly service. Beautiful decor, relaxed atmosphere. Highly recommended. 46.366889914.10891174 Simončinka, Ljubljanska cesta 4. Great fast food including burgers, chicken, and salads. 46.366127814.10708375 Topolino, Ljubljanska cesta 26, ☎ +386 4 574 17 81. 12PM-11PM, closed Tuesdays. Bled's most sophisticated outfit, georgeously decorated, and beautifully lit. High quality food and wine. Expensive. Most prices listed do not include tourist tax of €1.01 per person. 46.36143714.0805321 Camping Bled. In a beautiful green setting close to the lake. Free (but slow) WiFi at the reception. €8.50-12.50. 46.371041614.10419372 Bled Castle Hostel 1004, Grajska Cesta 22, ☎ +386 41 567 512, e-mail: castle.1004@gmail.com. Free internet. BACK Bar & Hostel, Grajska 21 (Above the George Best Bar, at the edge of town, next to Youth Hostel Bledec, just beneath Bled castle), ☎ +386 40 743 398. Five rooms with 20 beds. Free Wi-Fi. Laundry service. Adventure trips. 46.370764214.10341993 Bledec Youth Hostel & Penzion, Grajska 17 (On the edge of town). Popular place for families and adventurous pensioners! Member of Hostelling International. Breakfast included. Dorm bed: €18-22; Double: €36-48. Jakelj Backpackers House, Selo 11A 4274 Zirovnica (A little out of town (10 km), but there is free pickup in Bled from 8AM-8PM), ☎ +386 31 616889. Free pickup from the Bled train station. Free Linens/Towels and Internet. This hostel is run by a great family. The son runs some excursions and is very nice. The breakfasts were complimentary eggs (made by the mother) and are fantastic. Dinners at the hostel are €6 for 4 courses of Slovenian fare. The food is fantastic. They offer a huge range of activities (rafting, canyoning, horse back riding, outdoor camping, skiing, national park trips). Dorm bed: €15-20. 46.371423714.10620414 Traveller's Haven, Riklijeva cesta 1, ☎ +386 5 904 42 26. Features what are possibly the most comfortable mattresses in any hostel around the world! Located in a typical Bled house from the beginning of the 20 century in the old part of Bled, just a few minutes from the bus station or the lake, with the grocery store just across the street. It has 27 beds in 6 rooms, an equipped kitchen, living room and two small balconies. Free laundry machines. You can arrange free pickup from the train station. Free bike rentals. Dorm bed: €19; Double: €48. 46.36516714.10906755 Vila Gorenka Guesthouse, Želeška cesta 9, ☎ +386-4-5744722, e-mail: vila.gorenka@siol.net. Built in 1909. €17 per person. House Klasika (former Garni Pension Švigelj), Levstikova 2, Bled (in the centre of Bled, just 5 minutes walking distance from the lake. ), ☎ +386 4 5744 841, e-mail: info@houseklasika.com. Check-in: 14.00, check-out: 11.00. Family-run four star pension famous of it's hospitality, fabulous breakfast and traditional architecture. Free internet in all rooms (cable, wireless), free computer access, free parking. Double: €65-95. Apartments Špec, Levstikova 10, Bled (In the center of Bled, 5 minutes from lake), ☎ +386 4 574 14 77, e-mail: specg@g-kabel.si. 40 square meter furnished apartments for 2-4 persons. Quiet location, free computer access, free wi-fi, tvs in all apartments, free parking. €55-75. 46.371423714.10620416 Hotel Jelovica, Cesta svobode 8 (200m from the lake). Three-star higher middleclass hotel, connected with a pleasant park leads down to the lake shore. Single: €47-73; Double/Twin: €60-132. 46.367565914.11101437 Hotel Krim, Ljubljanska cesta 7 (3 min walking distance to the lake), ☎ +386 4 579 7000. 3 star hotel with 115 rooms. Restaurant and Wellness center. Breakfast included. Single: €52-68; Double/Twin: €76-104. 46.371423714.10620418 Hotel Astoria Bled. Single: €69-119; Double: €89-139. 46.364658614.10784769 Garni Hotel Berc (300m from the centre), ☎ +386 4 576 56 58, e-mail: hotel@berc-sp.si. 15 rooms. Family-run three-star hotel. B&B. No credit cards. Free internet. Single: €45-50; Double: €70-80 inc tax. 46.357251514.092764410 Garni Hotel Jadran, Cesta svobode 12, ☎ +386 4 579 1365, e-mail: hoteljadran@hotelibled.com. In a beautiful historic building overlooking the lake. Use of the wellness facilities at the Toplice is free of charge for guests of the Jadran. Single: €64-96; Double/Twin: €74-116. 46.36718614.110361611 Garni Hotel Villa Bojana, Ljubljanska cesta 12, ☎ +386 4 576 81 70, e-mail: info@bled-hotel.com. 3 star family-run hotel. 11 rooms. Free internet: LAN and WIFI in every room. Roof terrace. 46.365651514.109446712 Family Hotel Savica (300 m to lake, next to the Golf Hotel and Ziva Wellness Center). 3 star hotel. Pool. Family friendly, provides all necessary facilities for babies and young children as well as a broad animation program. Apartments and suites are available. Breakfast included. Single: €88-100; Double/Twin: €100-122. 46.365265614.107635613 Hotel Trst (opposite the Grand Hotel Toplice.). Guests may use the swimming pool of the Toplice free of charge. Single: €61-71; Double/Twin: €76-86. Hotel Ribno, Izletniška 44 (in the village of Ribno, 2km from Lake Bled), ☎ +386 4 578 31 00, e-mail: info@hotel-ribno.si. 58 rooms and three suites. Free wi-fi. Popular for weddings and corporate outings. Single: €79-98; Double/Twin: €93-115. 46.363977114.106065214 Pension Mayer, Želeška cesta 7 (200 m to lake), ☎ +386 4 576 5740, e-mail: penzion@mayer-sp.si. Restaurant and summer garden. Free wi-fi. Cottage and apartments available. Single: €55; Double/Twin: €75-80; Cottage: €120-150. Krek Hotel (5 km from lake Bled at the motorway exit Lesce/Bled,). 34 rooms. New modern hotel and restaurant, big secured underground parking, free internet access B&B. Single: €48-60; Double: €70-85. Krek Pension (Ribno, 2 km from lake Bled and 500 m from river valley Sava). Family-run three-star guesthouse. Excellent location for fishing and hiking. Single: €37-44; Double: €54-57. 46.35939414.096205415 Pension Mlino (On the shore of the lake), ☎ +386 4 574 14 04, e-mail: mlino@mlino.si. 13 rooms. Free wi-fi. Single: €35-45; Double/Twin: €50-70. Apartments Union, Ljubljanska 9 (300 m to lake), ☎ +386 4 57 80 110, e-mail: info@union-bled.com. Apartments available. Great bar downstairs. Accessible by disabled. Single: €25-55; Double/Twin: €31-38. Vila Ajda, Cesta svobode 27 (central), ☎ +386 4 576 83 20, e-mail: info@vila-ajda.si. Four apartments. Fish restaurant. Lake views. Four-person apartment €110. Pension Tiffany, Jarska Cesta 7 (in the very vicinity of the lake and the centre), ☎ +386 4 574 26 53, e-mail: pensiontiffany@telemach.net. All of the apartments have well equipped kitchens, bathrooms, bedrooms with cable tv and balconies. Parking place is ensured. Free Wi-Fi Apartment for 2, 3, 4, 5 persons, €45-90. 46.367031814.109102116 Best Western Premier Hotel Lovec, Ljubljanska Cesta 6, ☎ +386 4 6204 100. Check-in: 2PM, check-out: 11AM. 4 star hotel. Breakfast included. From €94 to €240. 46.365265614.107635617 Golf Hotel, Cankarjeva 4, ☎ +386 4 579 1700. 4-star hotel featuring the excellent Ziva Wellness Centre. Single: €125-160; Double/Twin: €135-190. 46.36516714.109067518 Grand Hotel Toplice, Cesta svobode 12, ☎ +386 4 579 10 00, e-mail: ghtoplice@hotelibled.com. 5-star hotel. Features thermal springs. Single: €140-195; Double/Twin: €150-240. 46.359245914.097095919 Hotel Vila Bled, Cesta svobode 26 (On the southern side of the lake), ☎ +386 4 575 37 10, e-mail: info@vila-bled.si. 4-star hotel. This was the private getaway of Marshal Tito during the days of Yugoslavia. In spite of its recent renovation, it hasn't lost any of its historic charm. The hotel also features a small new wellness studio. Double/Twin: €159 when booked for 3+ nights. King's Club House (on Bled Golf Course). 4-star hotel. Single: €170; Double/Twin: €238-258. 46.367369814.109507620 Park Hotel, Cesta svobode 15 (on the lake shore), ☎ +386 4 579 1800, e-mail: reservations.park@hotelibled.com. 4-star hotel. Features a swimming pool on its highest floor with a great view. The famous cream cakes were invented at the hotel in 1953 and over 10 million have been baked in its patisserie so far. Single: €103-125; Double/Twin: €130-170. Most of the hotels and hostels in Bled offer internet access. Be sure to take necessary precautions when participating in outdoor activities. Bled can become extremely crowded during the summer months especially at weekends. A visit during winter, while cold, presents you with the chance to see a frozen Lake Bled and have the place to yourself. Alternatively those seeking a bit of peace will find that the side of the lake opposite the town is often somewhat quieter. Bled Tourist Office, Cesta Svobode 15 (beneath the Hotel Park). This city travel guide to Bled is a usable article. It has information on how to get there and on restaurants and hotels. An adventurous person could use this article, but please feel free to improve it by editing the page. This travel guide page was last edited at 04:11, on 20 April 2019 by Wikivoyage user DaGizza. Based on work by Wikivoyage users Ikan Kekek, Alpinum8, Traveler100bot, Ibaman, Wrh2Bot, Iva poje and Traveler100, Wikivoyage anonymous users 31.15.138.136 and 89.212.182.104 and others.